Alexander Popescu intends to pass through a 3,000-kilometer trek from Romania to Brussels to EU purring message that the Romanian people do not want to exploration or extraction of shale, or cyanide leaching in his country, and protesting against TTIP. In the Czech Republic he will uses also colors Coalition HF STOP to express support for the adoption of legislation banning shale mining in the Czech Republic, because pollution do not knows any boundaries. He will also promotes global unification antofrack movement under flag Frack Free World, based in the Czech Republic Beroun in r. 2013. 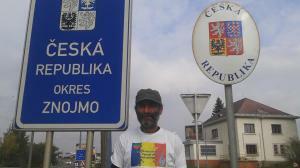 This day he arrived in Znojmo in Czech Republic. His route is listed below what day it is one tour. We will try his march to map online. We call on all those who can. that at least part of the route they went with him, who might in the target cities to provide free accommodation and meals will be grateful. He is in our beloved Moravia. 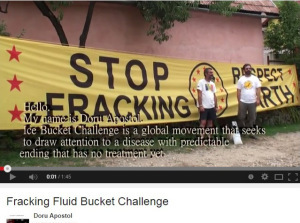 While the Romanian Government tries to impose environmentally dangerous projects with irreversible effects that threaten people’s health, Alexandru Popescu, the consciousness and the carrier of Romanian civil society’s message, initiated his demarche to bring into the public’s eye our country’s situation. Alexandru Popescu, a 46-year-old antiquarian and collector, and as himself likes to say, a “farmer peasant” – he grows bio-plants on a small land near Ploiesti – actively protested against RMGC cyanide gold mining project in Rosia Montana. In December 2013, after coming back from Pungesti, he spent 22 days hunger striking in Bucharest, at the University’s Square, outdoors, as a protest against the way the events took place in Pungesti during the same month, when the government pronounced “special state of emergency” as a reaction to the local community’s protests against the shale gas exploration and exploitation initiation by a foreign private company. For six months, the local community was subjected to terror through aggressive intimidating methods that recall the communist era, while the company’s site was being guarded day and night by the Romanian public funds paid law enforcement. All this time, until the first stage of the project was finalized, the locals where under pressure, asked for their ID even when taking their animals to the public lawn and the access to the “restricted area” or the site was completely forbidden. For six months, Silistea-Pungesti, an usualy calm region, where people were dedicated to rising animals and agriculture, became an area left outside the European Union, a militarized area with locals living hard experiences. All those human rights breakings and abuses where clamed in the non-profit organizations reports, such as Friends of the Earth Europe: “Threats to human rights defenders in Pungesti: Field visit report on the struggle of local population affected by the development by Chevron of new shale gas project without their consent”, 9 December 2013 and APADOR – CH. Despite all the community’s protests and the fact that more that 60% of the country’s land is already leased for shale gas exploration/exploitation, the Romanian government announced the auction of new hydrocarbons exploitation sites, 28 onshore and 8 offshore, which could have catastrophic effects on the environment, soil, water and people’s health in the entire country. Romania is the target of oil and gas industry giants, who, supported by the government, want to implement dangerous projects that will affect the whole country. Alexandru wants, through his demarche, to call the attention, nationally and internationally, on the danger brought by the possible signing of TTIP (Transatlantic Treaty for Commerce and Investment) and other similar treaties, which represent a constriction of democracy and national constitutions, in the benefit of big corporations. Introducing ISDS (Investor-state dispute settlement) to this treaty represents none the less the justice’s privatization and prove of breaking the human’s rights. To all the above we add the unreasonable deforestation to which the authorities take no measures, actions that affect all of us. 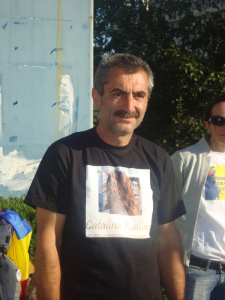 Alexandru Popescu, as a mountaineer and lover of nature, could not remain passive to all of these and decided to start a journey to Brussels, on foot, with the intention to hand to the European Parliament the Romanian civil society’s message regarding its position towards all these extremely sensitive subjects. Alexandru Popescu aims to awake the civil society in all the countries he will pass through and to convince as many as possible to join him. His message for the Europeans is that every single citizen must become conscious that projects using environmental irreversible impact technologies – such as high volume fracking and cyanide – developed in a European state will affect one way or another – food imports, climate change, growing lack of water, growing desertification, air and water pollution – every European. His journey, started on August 30 in Ploiesti, will continue until November 30, when he plans to reach his destination – Brussels. Alexandru will walk for more than 3000 km and will cross some big European capital states: Budapest – Wien – Prague – Paris – Brussels. Alexandru Popescu specifically wants that the date of handing his message to the European Parliament to be the National Day of Romania, 1st of December.